Aim: A large-scale, exploratory survey had been conducted on the whole population of family businesses in Hungary in 2017/18 concentrating on the heterogeneity of the family business population. This paper presents the findings of this survey focusing only on the governance practices of the Hungarian family businesses. Design / Research methods: Two questionnaire were asked from a sample of Hungarian family businesses in the form of computer-assisted phone interview. This sample is based on probability sampling of a larger database representative to the Hungarian population of business organization in terms of annual revenue, geographical location and industry. Questions were formulated considering models of family involvement, socio-emotional wealth, succession, governance and professionalization. Conclusions / findings: Hungarian family businesses succeed in involving a growing number of family members into the company which also positively relates to the business performance of the firms. The developmental patterns of their governance practices reflect their increasing level of professionalization. However, they can hardly involve external, non-family professionals into the Top Management Team, which may be crucial especially for the further growth of medium-sized firms. Their family governance concentrates rather on operatively bridging family and company, and not on planning the maintenance of long-term family control. 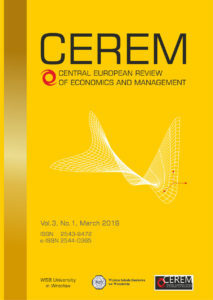 Originality / value of the article: The paper delivers both information on the heterogeneity of the Hungarian family businesses from a governance-related point of view, and show direct, practical implications regarding the family business governance system. Its results can be of interest both for family business owners, researchers and consultants. Keywords: governance structure, family business, family business governance, family governance, Hungary. Aim: If companies manage their inventory inefficiently, inventory costs can increase significantly due to shortages, overstocking, and risks. Thus, inventory management is critical for company’s success which, in turn, impacts on countries’ development. This paper aims to investigate the efficiency of inventory control systems of companies from Brazil and Chile through Optimal Control Theory (OCT) and Data Envelopment Analysis (DEA). Design/Research methods: Data was collected from Chilean and Brazilian companies covering different industries in which both countries are mostly dependent (commerce, mining, nonmetallic minerals, fishing and agriculture). Then a new approach using OCT and DEA is applied for dealing with inventory, production, and demand in a Dynamic DEA model to benchmark these companies’ production-inventory systems. Conclusions/findings: The results allowed the identification of efficient companies among evaluated industries. Such companies are related mainly to Brazilian commerce and Chilean exports. Based on the findings, it was possible to identify patterns and relationship among companies and its inventory management. Originality/value of the article: This paper fills a gap in studies including demand, production, and inventory in Dynamic DEA by using OCT to forewarn unrealistic results and observing companies’ behavior. Besides that, this approach is particularly useful for developing countries in this context, determining the benchmarks for the most inefficient firms in each sector. Implications of the research: The results show (1) which companies should focus more on improving inventory management, (2) which companies should be used as benchmarks, and (3) it highlights the reasons of different performance of companies in each country. Limitations of the research: For future research, it is suggested including variables and analysis of social and environmental impacts. The use of more detailed sector classification is recommended. Keywords: Data Envelopment Analysis (DEA), Optimal Control Theory (OCT), Dynamic Efficiency, Developing Countries, Inventory Control, Production-Inventory System, Benchmarking, Best Practices. Aim: The aim is to show market indications with respect to how to alter training investment management so that to improve the impact of training on the organization’s performance. The topic is important because the effectiveness of business practice in training processes in Polish organizations continues to be poor due to the lack of benchmarks in the form of good practices or research. Design / Research methods: The paper cites research findings which illustrate the existing practice of training management in Polish companies, as well as studies allowing for identification of the key indications for changes. The research methods employed in the findings cited belong to the category of pragmatic methods drawing on quantitative data gathered based on a questionnaire and quantitative and qualitative data gathered on the basis of an interview. The data stemming from the research cited are obtained through a subjective interpretation of the existing processes and phenomena. Conclusions / findings: TDI Study shows that the following are the weakest link in training processes. The area of evaluation from the perspective of assessing how the training affects the firm’s performance. The area of managers’ commitment during the stage of applying competences on the job. The study of Indications for Training Process Transformation shows that the crucial change for an organization in the context of improving business effectiveness of training is to shift the focus of the analysis of needs from being centered solely on the competence gap towards identifying potential impact of training on business performance. The most realistic change involves introducing tools designed for managing the implementation phase and building awareness among participants that training is not merely an element of knowledge acquirement but an obligation to change behaviors with this change yielding business advantages for the company. Originality / value of the article: The value of the paper lies in using benchmarking studies, the only ones in the Polish market, within the area of training policy effectiveness, and referring them to an innovative methodology of training project management. The findings and conclusions are of interest mainly for people who are responsible professionally for training management in that they allow for narrowing down the focus of actions aimed at improvements in the field of managing personal development. Implications of the research: The findings show how to redesign optimally the training schemes in organizations. Within a general scope, they suggest those areas within training management which, if improved, should have the strongest impact on business outcomes. Aim: The aim of the paper is to delve into the Human Resource Management (HRM) practices which undoubtedly translate into enhanced business performance. The article combines the theoretical study of HRM with its application to professional practice in order to provide a comprehensive analysis of the reasons and ways of implementing good HRM processes. Design/Research methods: A desk case study approach has been adopted to conduct a descriptive-comparative analysis of two prosperous corporations operating in distinct sectors. Conclusions/findings: It is suggested that the analysed companies have been consistently outperforming their competitors due to their HRM practices which can be linked back to the seminal motivation theories and concepts relating HRM to performance. It seems that especially the application of AMO framework and Path-Goal Theory to workplace scenarios can yield good results, regardless of the industry. Originality/value of the article: This study not only provides an insight into the HRM practices which appear to contribute most to improved productivity, but it also attempts to shed some light on the how and why of their application. So far, much of the empirical research has confirmed a significant statistical connection between HRM practices and business success, but relatively little attention has been paid to understanding the exact mechanisms through which conceptual HRM practices can be implemented. An attempt to address this gap is the value added of the paper. Implications: The findings may prompt the upper echelons of power in companies to fit the appropriate HR practices into their business strategies to achieve the organisational objectives. Aim: In the 21st century, energy security is one of the most important elements of contemporary politics and economy. The German turn in energy policy is the first attempt on a global scale to move away from nuclear energy to the use of renewable energy (RES -Renewable Energy Sources), albeit with a temporary increase in the use of conventional energy sources (in particular coal). The authors undertook to analyze the course of the German policy turn as well as new opportunities and threats to the stability of its energy system, notably electricity sector. Design / Research methods: In order to analyze the course of the German turn in energy policy as comprehensively as possible, the authors recurred to various studies, often presenting divergent points of view on changes in the German energy industry in recent years. The research process was based on the analysis of the content of the materials subject to consideration. Conclusions / findings: The analysis carried out shows that the efforts to increase the share of renewable energy will be continued in the near future, while limiting the role of traditional energy sources, with the exception of lignite. The policy will also directly lead to a continued importance of natural gas for the global economy. The changes taking place in the German energy balance to a certain extent limit the country’s energy security. This is due to the fact that supplies from wind and solar power plants that are to become dominant in the German energy system are of high volatility and thus constitute a significant threat. Progress in generating energy from renewable sources is not accompanied by similar progress in its storage, and without such storage capacity renewable energy sources will never be stable. Originality / value of the article: The doctrinal assumptions of Energiewende (German energy transition) are fully consistent with the assumptions of the European climate and energy policy, which is also very important from the point of view of Poland. However, attention should be paid to the fact that too rigorous approach to its implementation may – still for a long time – threaten the economy and energy security of Germany and of other European Union states. Implications: The conducted analysis unambiguously indicates the direction of the energy policy turn in Germany and in other EU states, as well as a change in the way the energy security system operates. The example of Germany, a highly industrialized country seeking to actively participate in the fulfillment of the commitments regarding the international mechanisms designed to combat the climate change, in particular by the transition of its energy sector towards a near zero emission economy, may provide model solutions which could potentially be adopted in other countries. Aim: In the first section of the paper, a brief outline is presented of the economic theory delineating the concept of unemployment and its association with the level of wages. The concept of unemployment and contemporary theories of this phenomenon are discussed. The paper also includes criticism of certain parts of neoclassical theory of the labour market which represents the author’s own thoughts. It is concerned especially with the equilibrium price on this market, in other words, the level of wages and labour supply curve. The aim of the paper is to analyze the effect of unemployment on the level of wages in the enterprise sector in Poland. Design / Research methods: Linear correlation between monthly data from 2000 to 2014 were used. Certain measures were employed, such as differencing or shifting time series (in both directions), to avoid the effect of seasonality, that is, of apparent correlation on the study results, and to determine precisely the direction of correlation between variables. This methodology allows for increased reliability of the results produced. Conclusions / findings: Thanks to that, it was possible to observe a clear statistically significant negative effect of unemployment on the level of wages in Poland in the analyzed period. This effect, on both nominal and real wages, was lagged by one month. Originality / value of the article: The results of the research represent scientific value added of the paper and can be taken into consideration while making decisions concerned with the country’s macroeconomic policy. Keywords: unemployment, level of remuneration, wages, linear correlation. Aim: The implementation of numerous EU projects in the period 2014-2020 is bound to require that they are compliant with EU law, domestic law, relevant guidelines, programming documents, and the content of an agreement on co-financing a project. It is in this context that the issue of public aid should be examined. On the grounds that some EU projects are subject to the regime mentioned, what becomes vital is to comply with all binding regulations in this respect. It is in this delineated form that the legal form of regional investment aid should be considered. The aim of this paper is to examine individual material elements of which the legal construction mentioned above is composed – while taking into account existing legislation. Research methods: The method that was adopted involves an analysis of the sources of law, case-law and literature. Conclusions: (1) The problem of regional investment aid should be considered in terms of the Treaty definition of public aid. At the same time, one has to take into account the legal regime set by the TFEU on state aid. As a rule, this aid is prohibited; still, the EU legislator allows for a number of exemptions. (2) This, in turn, means that it is necessary to develop, by issuing other normative acts (but also soft-law regulations), the Treaty provisions which allow for providing legally benefits covered by state aid. (3) The legal form at issue here should be considered in the context of the need to ensure that beneficiaries will be implementing projects in accordance with the rules of EU law, domestic law, relevant guidelines, programming documents and the content of an agreement on co-financing a project. Value of the paper: The set of issues examined is the subject addressed by case-law and literature. The value of the paper is that it systematizes all the elements discussed. The paper is addressed to the beneficiaries of EU projects, institutions participating in the system for managing and controlling EU resources and to administrative courts. Aim: The paper considers the issue of responsibility on the part of contemporary organizations for their employees. In her paper, the author described ISO 26000 guidelines for organizations concerning labor practices and the impact of these guidelines on competitiveness of organizations. The paper also analyzed labor practices implemented by firms in Poland in the years 2013-2015. Design / Research methods: Based on statistical data and literature study as well as Responsible Business in Poland. Good practices reports., the period 2013-2015 is considered for analysis. Conclusions / findings: Entrepreneurs in Poland seem to take more responsibility for employees, while recognizing the key role played by human capital in building competitive advantage of an organization. This also supports the company’s image and competitiveness, while improving employee loyalty. Keywords: human capital, contemporary organizations, responsibility for employees, corporate social responsibility, ISO 26000 standard, Poland.